Buying Guide: Find The Right Flat Iron for Curly Hair! So what should you look for in a straightener to use on your curly hair? Do you have naturally curly hair that seems almost impossible to straighten at times? It’s a common problem with many people that share your same hair type. Many people with curly hair get so frustrated when trying to straighten it that they just give up trying altogether. That is a shame because many times people who get frustrated trying to straighten their curly hair are sampling using the wrong flat iron on it. The best flat iron for curly hair will really help you work through most any problem you encounter while trying to straighten it. That is exactly why we have written this article. In it, you will find many informative flat iron for curly hair reviews. You will also get some good advice on what to look for when shopping for a straightening iron to use on your curly hair. By the time you get done the reading you will know exactly what type of flat iron will work best on your particular type of curly hair. Its name says it all. 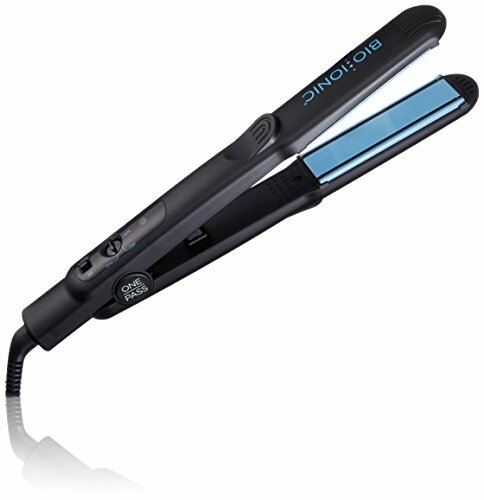 The BIO IONIC Onepass Straightening Iron makes straightening curly hair simple and often it can do it in just one pass. It is able to get stubborn curly hair to straighten by using a combination of such things as high heat (up to 400°F) and Bio Ionic’s fast and even ceramic heat technology. But that’s not all you get that helps you straighten your curly hair with this flat iron. This straightening iron helps protect your curly hair from damage as you are using it too. That’s because it includes moisture retaining Nano-ionic infusion. It even has added silicone strips to help you eliminate hair drag so you can straighten your curly hair faster. The key to how well this flat iron works on curly hair lies in its ability to produce high heat and its versatile titanium heater plates. Its 1” wide plate size can handle different lengths of curly hair and its 265°F – 450°F heat can make even the thickest hair become pliable enough to straighten it. 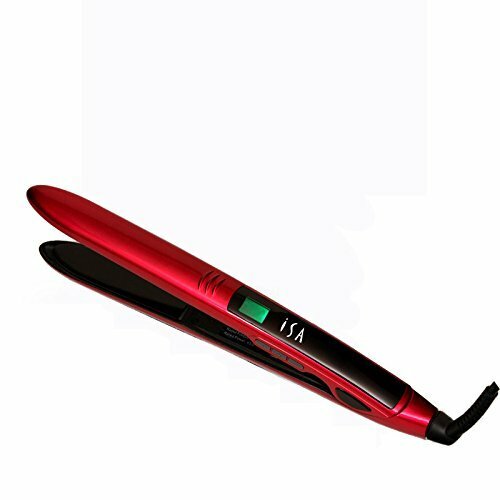 The ISA Professional Titanium Flat Iron has a few other very nice features too. Among these are its neon LCD display and the mirror smooth finish on its heater place that helps eliminate hair snags as you use it. This flat iron even has beveled edges and a rounded tip so you can use it to make waves and more subtle curls too. There is no better way to get stubborn curly hair to straighten than to do it using a flat iron with multiple heat settings and floating heat plates. That is exactly what you get from the Onei MK-I Halo Ceramic Flat Iron. It features a wide heat setting range (150°F to 450°F heat) and 1” wide dual floating plates that stay in contact with your hair longer as you straighten it. 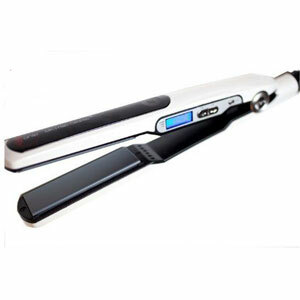 This Onei straightening iron also has fast and even heating ceramic coatings on its heater plates. 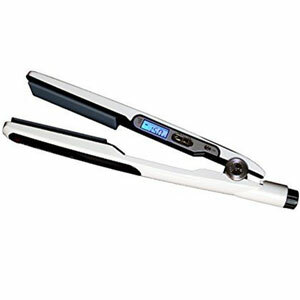 The temperature is controlled digitally for extreme accuracy and its rounded edges keep your hair from getting caught on it as you straighten it. If you want to straighten your curly hair safely and easily there is no better way to do that than by doing it with a flat iron that uses far-infrared heat and has many different heat settings. That describes the Solano Sleekheat450 Professional Flat Iron perfectly. Its gentle far infrared heat can be set anywhere from 170°F to 450°F. You should not overlook its other nice features either. This Solano flat iron also has ceramic coated and tourmaline infused heat plates. These help the heat plates on it heat evenly and even allow your curly hair to retain more moisture as you straighten it. It weighs only 12-ounces to so arm fatigue is rarely a problem when using it. You don’t get any more popular names in hair styling tools than CHI. This flat iron from them certainly does not disappoint. It works well for curling short hair for two reasons. One is its 1” slightly curved floating plates stay in contact with your hair longer to get the most heat possible into it. The other is you can use up to 410°F heat to straighten your curly hair thanks to its multiple heat settings. 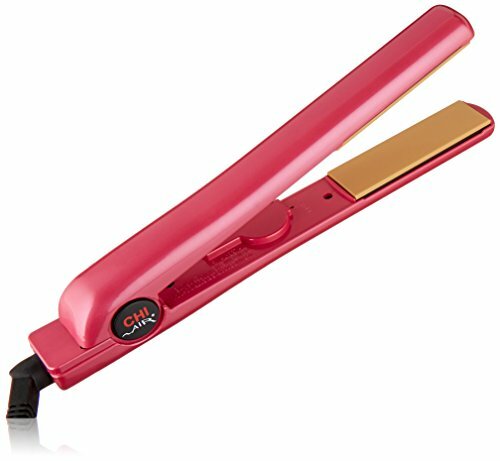 With this CHI hair straightening tool, you also get fast and even heating thanks to its Tourmaline/Ceramic heat plate infusion. It also features gentle heating far-infrared heat generation. You can even take it with you anywhere in the world you travel thanks to its dual voltage capability. 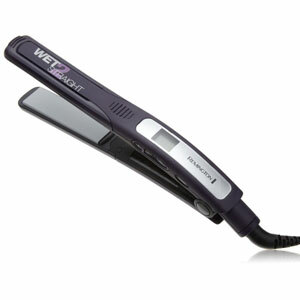 Here is a rare flat iron that you can even use wet. There are special vents built into it that let out the super-heated steam it produces before it can damage your hair. It’s a real time saver to be able to dry and straighten your curly hair at the same time. That’s not all you get from this straightening iron either. It has a curved ceramic plate design and it’s ready to use in just seconds after startup. It also has 30 digitally displayed heat selections (300°F – 400°F), tourmaline infusion and a very versatile slim 1” plate design. You may be wondering why curly hair is so tough to straighten. The reason for that is curly hair is usually thicker and coarser than straight or wavy hair. Along with being thicker or denser, that also means it has strong protein bonds that are harder to break down so your hair will straighten. These are the very reasons why not just any flat iron has the ability to safely straighten curly hair. Whenever you are straightening your curly hair the more options you have for doing that the better. One of the things it’s nice to have multiple options with is your flat iron’s heat settings. The more you have the more likely you are to find a heat setting you really like to use when straightening your hair. We mentioned that curly hair is usually thick and coarse. One thing to note is that word ‘usually’ has some play in it. That is because not everyone has curly hair that is thick or coarse. That also means that not everyone has curly hair that needs extreme high heat to straighten it. That is why it’s preferred to have a variety of heat settings on your flat iron. Keep in mind this is just a rough guideline that works for most people. To be on the safe side, always start out at the lowest heat setting in the suggested straightening heat range for your curly hair type. Work your way slowly in the heat range until you find a setting that straightens your curly hair easily and does not damage it in the process. When have a ceramic coating on your heat plate you are pretty much guaranteeing yourself that your flat iron will heat fast and heat evenly. You certainly don’t want any hair damaging hotspots and that is why ceramic heat plate coatings are so widely used. If you are one of those people that seems to always be in a rush to get ready in the morning than straightening your curly hair with a flat iron with titanium infused heat plates is the way for you to go. 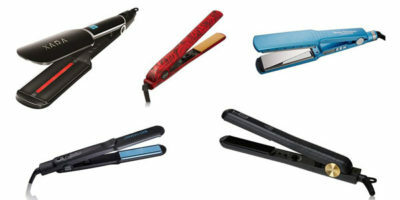 Flat irons with heat plates that have titanium infusion are usually ready to use in a matter of seconds. It’s all about creating negative ions with this type of heat plate infusion. These negative ions work in a way that helps your hair retain more moisture as its being straightened by high heat. It will also leave your hair with more shine and help eliminate frizz, split ends and flyaway hair caused by static electricity. This type of heat plate infusion does all the same things as tourmaline heat plate infusion does but in a supercharged way. It’s technology that is said to help your hair retain 25% – 50% more moisture that tourmaline crystal infusion does. Your hair will be much shinier after you straighten it with Nano infused heat plates also. The smoother your flat iron heat plates are the better. That is where silk heat plate infusion comes into play. Silk infused heat plates are among the smoothest you will find on any flat iron. This cuts down on hair drag and allows you to straighten your curly hair much faster. Keep in mind that many of these straightening iron heat plate infusions and coatings are used in conjunction with others. That’s ok and it’s actually preferred. There is really no evidence that says a flat iron will not work well if it has many different heat coatings and infusions. So if you can get a flat iron with multiple heat plate coatings and infusions go ahead and do it. You will find few aspects of the curly hair straightening process that are more often overlooked than the width of the plate size on a flat iron. That is because it’s a lot more important than people give it credit for. Here is how the different size heat plate widths can aid you during your curly hair straightening process. Smaller size heat plate widths do a much better job at straightening short curly hair than do larger size ones. They enable you to get in closer to the scalp and tend to be more maneuverable overall which is essential to short curly hair straightening. These are widely considered to be the most popular heat plate widths on a flat iron. That is because these size flat iron widths can handle most long and short curly hair straightening needs. Using a straightening iron with these heat plate widths will usually allow you to turn your curls into gentle waves or reshape your natural curls too. This should be your choice if you have long to medium length curly hair. It’s all about heat plate surface area when straightening those hair lengths and wider heat plates give you that. Floating heat plates have really changed hair straightening irons for the better. They help your hair stay in contact with the hot heat plates longer as your hair passes through the flat iron. The longer a strand of curly hair absorbs heat the easier it is to straighten. Floating heat plates cut down on both the time and effort it takes to straighten your curly hair. 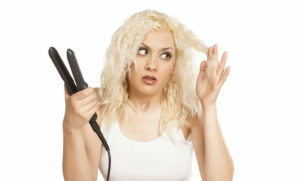 Holding a heavy flat iron will tire you out much faster than you think as you straighten hair. This is especially true for professional stylists that use flat irons many times throughout their workday. So when shopping pay particular attention to the weight of any flat iron you are thinking about purchasing. Super lightweight straightening irons usually weigh less than 1 pound and acceptable weight flat irons run under 1 ½ pounds. You certainly want your straightening iron to be easy to use also. There are certain things built into a flat iron that really help with this. When out shopping for a new flat iron look for things such as digital temp setting and long power cords with swivel ends that make them easier to use. Ultra-smooth heat plate surfaces will help you straighten your hair faster too. Always prep your hair properly before straightening it – this includes shampooing it (best done the night before) and then making sure you pat it dry. Your curly hair should have very little dampness to it (85% – 95% dry) before starting the straightening process. Treat your curly hair with protective serums or oil – heat is your curly hair’s friend when it comes to straightening it but it’s an enemy to your hair’s health. That is why it’s recommended to put on a thin layer of heat protective serum or protective oil like argan oil before you straighten your hair. Ask your professional stylist what they would recommend you use for this step. Comb your hair thoroughly before straightening it – one of the keys to getting your hair to straighten easily as you use a flat iron on it is its ability to pass smoothly over the hot heat plates. Getting out all the tangles and knots in your hair will really help your hair pass easily over the hot heat plates. Section your hair before straightening it – the next time you are in a hair salon watch closely if one of the stylists is straightening a client’s hair. You will notice they always section it beforehand. This is a time-tested method to help any hair straightening process turn out looking better. Question: I just bought a new flat iron and have not used it yet. Any suggestions before I use it the first time? Answer: I have two big suggestions for you. The first is to thoroughly read through your owner’s manual and instructions before using it. This is because even if you are an experienced flat iron user your new flat iron may work totally different than your previous one. Be careful using a very high heat setting initially too. Just because you straightened your hair easily without damaging it at 390ºF with your old flat iron does not mean that will work with your new flat iron. Start out with a lower heat setting to make sure you don’t damage your curly hair. You can adjust the heat upward as necessary until you find a heat setting that works great and is easy on your curly hair too. Question: Do flat irons have to ever be cleaned? Answer: Great question and the answer is yes. As a matter of fact, one of the main reasons any flat iron stops performing well is the fact that it has started to build up unwanted residue on its heat plates. This keeps your hair from flowing smoothly across them which is a vital part of any hair straightening process. How do you clean your flat iron? There are actually several different ways you can accomplish this. One of the best ways is to simply wipe the heat plates down with a soft cloth after you use it (be careful not to do this if the heat plates are still very hot). For cases where you are starting to get some residue build-up try this. Once the heater plates have cooled completely grab a few soft cotton balls. Next, dip them in rubbing alcohol and swab the plates clean. Once that is done a finished wipe with a soft cloth should leave your heat plates looking shiny and new. We can’t emphasize enough how much easier it is to straighten your curly hair with a flat iron that has the characteristics we talked about in this article. 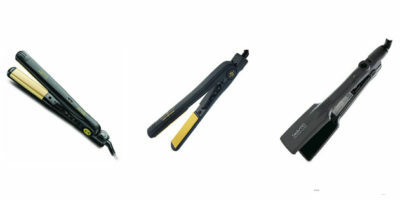 It will save you time and frustration if you are using the best flat iron for curly hair when you are straightening it. Once you use one of these premier curly hair straightening tools on your hair you will wonder why you didn’t start using it years ago. You have enough information now to make a sound choice in the flat iron you will now use on your curly hair. 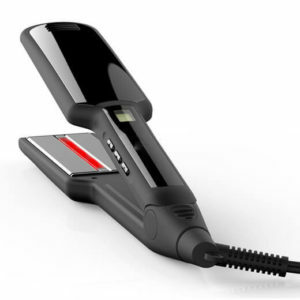 We have even taken the guesswork out of the process by doing several flat iron for curly hair reviews. You can’t go wrong by purchasing any of these straightening irons to use on your curly hair. If you don’t like any of these just follow the advice in the buying guide and you will have no problem finding the perfect flat iron to use on your curly hair.